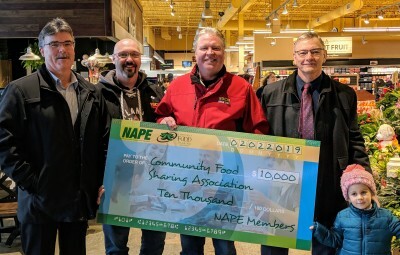 St. John's (08 Feb. 2019) — Like many, the members of the Newfoundland and Labrador Association of Public and Private Employees (NAPE/NUPGE) were devastated to learn about the horrible fire that struck the warehouse of the Community Food Sharing Association (CFSA). The fire is affecting 54 food banks across the province. Many people and groups have been assisting CFSA by running food drives to help replenish their stock. On the weekend, over $180,000 was raised and 50,000 pounds of food collected through the VOCM Care Share to Care Food Drive at 2 local grocery stores. On behalf of all NAPE members, the union is incredibly proud to donate $10,000 to the association to help them get back to supporting our province’s most vulnerable. The tremendous response from the community in response to this event has been inspiring and we are so happy to play a part in that effort.